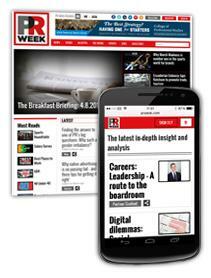 Immerse yourself in the world of PR and communications with PRWeek. Enjoy unlimited access to prweek.com, the world’s global PR destination with editorial staff in London, New York and Hong Kong. Plus: a breakdown of the top performing PR agencies with the Top 150, the latest winners and losers in Public Affairs, advice for agency heads and ambitious PRs in Agency Doctor, and a host of in-depth analysis and opinion pieces exploring the industry’s most pressing debates.